"If you liek deepfried ingridients in your sushi - or deep frieng the whole thing - you should know about tempura." Fried sushi ingredients coated with tempura – such as shrimp tempura sushi roll. A fired sushi roll – entire roll is coated with tempura – That’s done when dipping an entire inside out roll in tempura batter, then usually rolled in panko as well, and then deep frying the entire roll. A very successful trick is to use melty cheese inside the deep fried roll. Works very well with a philadelphia sushi roll topped with parmesan cheese, for example. Want to make tempura shrimp? Great idea! If you need any help – follow this tutorial for making shrimp tempura at home for the first time. Is it good for marking sushi? Oh yea! 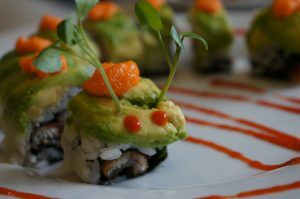 Check out our recipes for Dragon SushiRoll & the Caterpillar Sushi Roll. 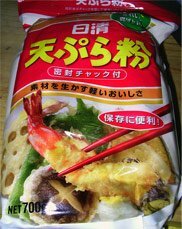 Both make use of tempura fried shrimp wonderfully.